WE’RE CRUISING AGAIN IN 2019! With your feedback, we have decided to extend the trip from three to four days! 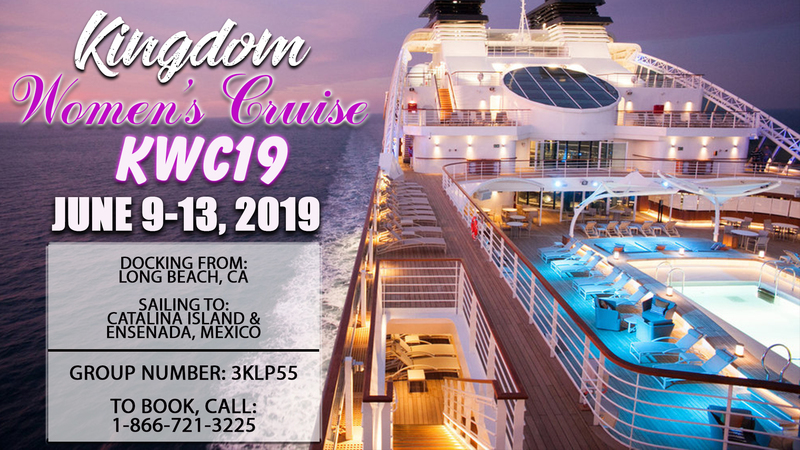 More cruising, more fun, more girl time, more karaoke, more laughter, more Kingdom Women! *Please note that you are responsible for booking your own cruise, referencing our group number. You will pay the current daily rate for the cruise, but keep an eye out, Carnival has regular SALES! (The group is NOT sold out. We do not have a "block" of group rooms at a group rate). Referencing our group number ensures that you will be on our list for our events and invites, as well as receiving a special gift from Pastor Kelley on the ship. *We are docking from Long Beach, California. You are responsible for your transportation to and from Long Beach, CA. I can’t wait to cruise again! It can only get better and better so grab your mothers, daughters, aunties, cousins, nieces, sisters, and all your girlfriends. KWC19 is going down! We are so excited to be offering round trip service via Charter Bus to the Long Beach Cruise Terminal from Kingdom in the Valley. The cost is $100 roundtrip which includes departure and return. You MUST secure your spot with a $50 deposit. It is a FIRST come first serve basis. So, please don’t hesitate to book your spot as they will fill up quick! Your final payment ($50) is due May 1st, 2019.